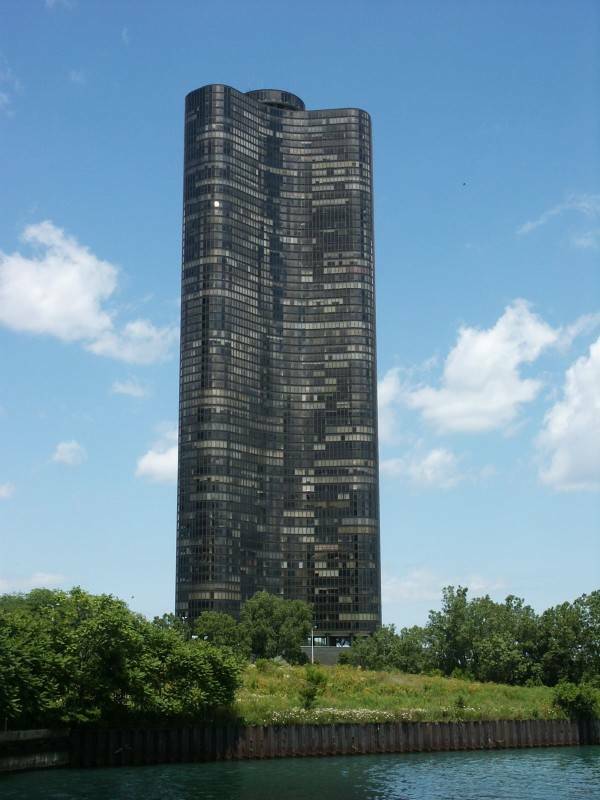 Chicago's tallest all-residential building. Sammy Sosa aparently lives in this tower. I think I centered it really well, especially considering that I have a tendency to improperly center or tilt the horizon despite trying not to! This is an ucropped picture. Great shot! That is one tall tower to be living in....at least for me... since I hate heights and won't even get on my roof which is about 15' up. :P I also love the way the clouds reflect upon the glass all the way down the building...very nice indeed! Klaus, I agree, but I like the drama of this angle. Here's another picture I have of the building. After tinkering around with the rotation, I decided that there's no definite "up" in this photo. But personally, I found another building not too far away with a more stylish art-deco look rather than the Mies Van de Rohe look of the Lakeview Tower. 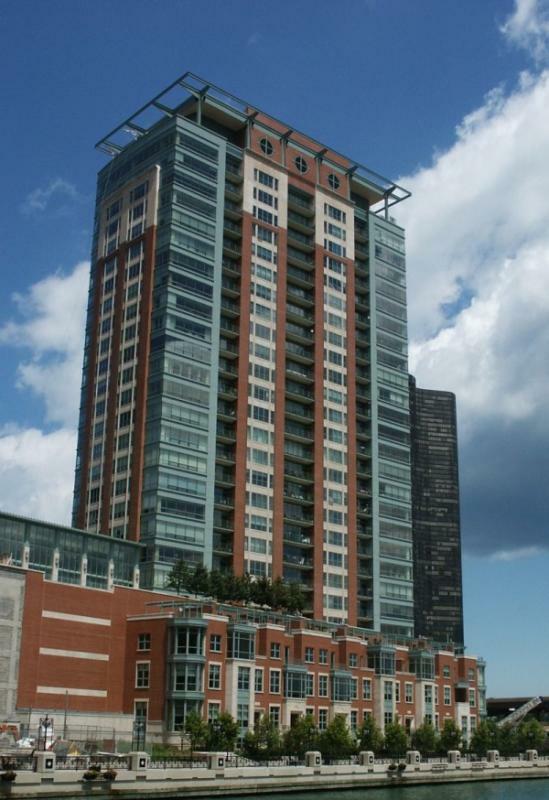 Selvin, your angle of the Lakeview Tower shows some landscaping could make the view of the tower a lot more pleasant. Somebody needs to yank out those weeds! What camera was the very first picture taken with? The DSCF717? I see that you own this camera, and was just wondering what your thoughts were on it. I own one....but I am not 100% satisfied with it. It may be my inexperience with digital cameras. My previous digicam was a Sony DSCS75. I mainly used this camera on auto and it took fantastic pictures whether the lens was zoomed all the way out or in and no matter the resolution setting. What I am finding with my new camera is that images do not seem to be as sharp with the lens zoomed out at its fullest. Is this normal? And if I set it to the highest resolution....There seems to be alot of noise...even if the condition seem fine. This is with the settings on the auto mode, fine quality. The images are definitely less clearer at the higher resolutions. I set my monitor up to 1600X1200 with 32M color and they still look bad. Is this normal or do I have a camera issue? If anyone can help with this matter please let me know. Sorry...not trying to take away from this post (urbanphoto) but if the first image was taken with the 717 then....maybe I'm doing something wrong. UrbanPhotos I like your first one, quite impressive ! selvin, the first one is the reply to Klaus hint ! What keeps happening to the posts in this thread? Some of them dissappeared, and I made a post about it, and now that post is gone too!